Your young and courageous Cougars once again defended the Cougar’s Den from an onslaught of hungry Dragons from St. Georges School from beautiful Milner, Ga. St. Georges is more known for its Cross Country and Track and Field success than their baseball prowess, but they proved to be a very formidable opponent. The Dragons came to bat in the top of the first inning. 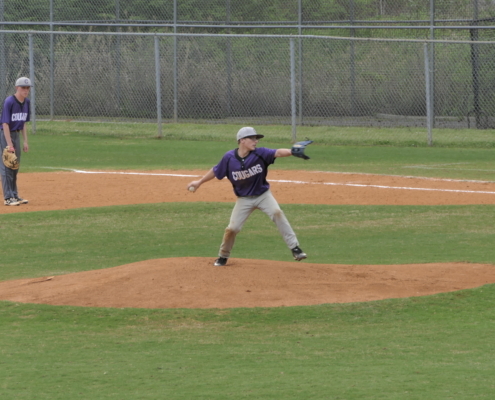 Junior Seth Goldberg took the pill to the hill to face the fire breathing monsters. Goldberg promptly stuck out the first batter on 4 pitches and the Cougars were off and running. An error, a single, and a walk loaded the bases. 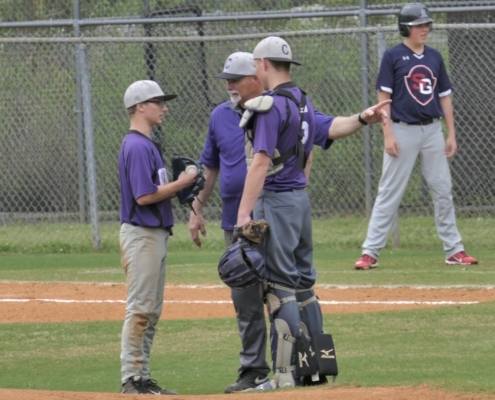 Goldberg settled down and induced a fly ball that was corralled by Junior shortstop Shane Hendrickson and a strikeout that ended the inning with no runs scoring. The bottom of the first was a tough one for the Cougars as they were unable to solve the riddle that was the young pitcher for the visitors. 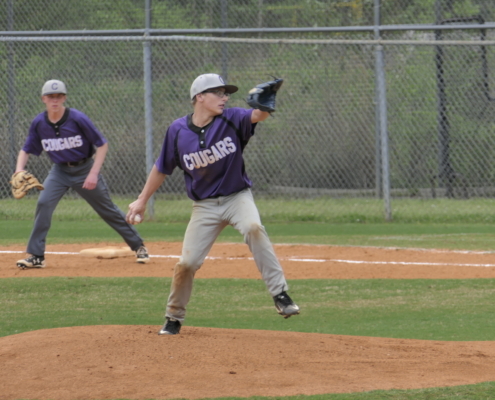 The Cougars could not gain momentum even with two runners on base. At the end of one complete, no score. The top of the second inning produced a play worthy of ESPN’s Top Ten plays of the week. 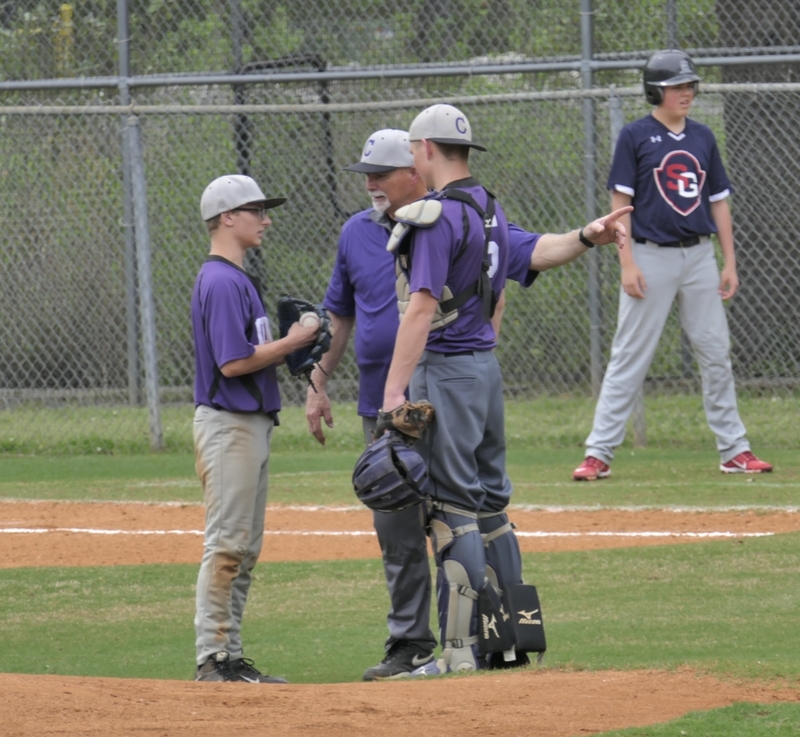 After Junior pitcher Seth Goldberg handled a ground ball and threw the runner out at first the young pitcher then hit the next batter he faced. Settling down, Goldberg then struck out the next batter for the second out of the game. The lead-off hitter then came up. On the first pitch he saw the batter laced a line drive over Freshman center fielder Aidan Briggs’ head headed to the fence. The runner at first took off running like the wind headed to second and then raced for third. The young and talented center fielder tracked down the ball in deep, deep, center field turning a firing a strike to relay man shortstop Shane Hendrickson. The runner approached third and the third base coach then told the fast runner to head home and he did running faster and faster as he approached the plate. 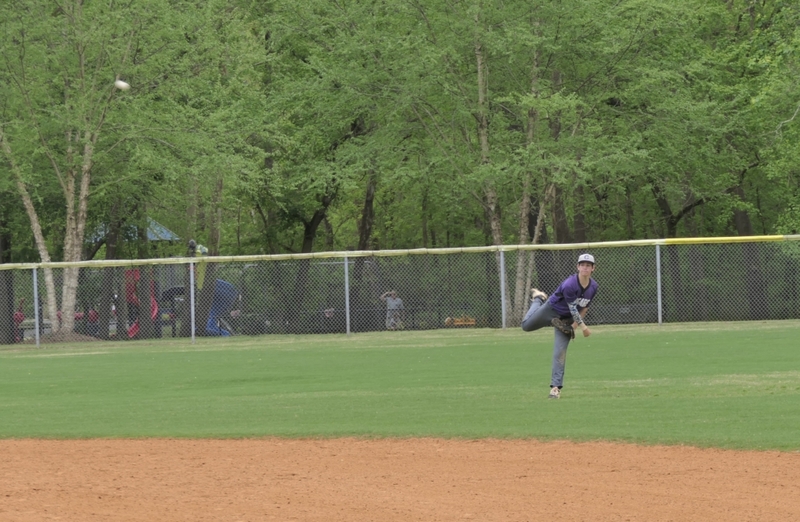 Meanwhile, Hendrickson received the ball from center field using proper fielding techniques and then threw a perfectly thrown ball to Senior catcher Brett Boyles who confidently caught the ball, blocked the plate and tagged out the runner preserving the scoreless tie. Whew!!! I am tired just writing that. At the end of one and one half innings of play still no score. Due to time constraints, we will skip ahead to more action later in the game. In the top of the fourth inning the Pete the Magic Dragon finally dented the scoreboard with three runs. An error, a walk and a double scored three runs. So at the end of three and one half innings of play, TCS 0 and Dragons 3. 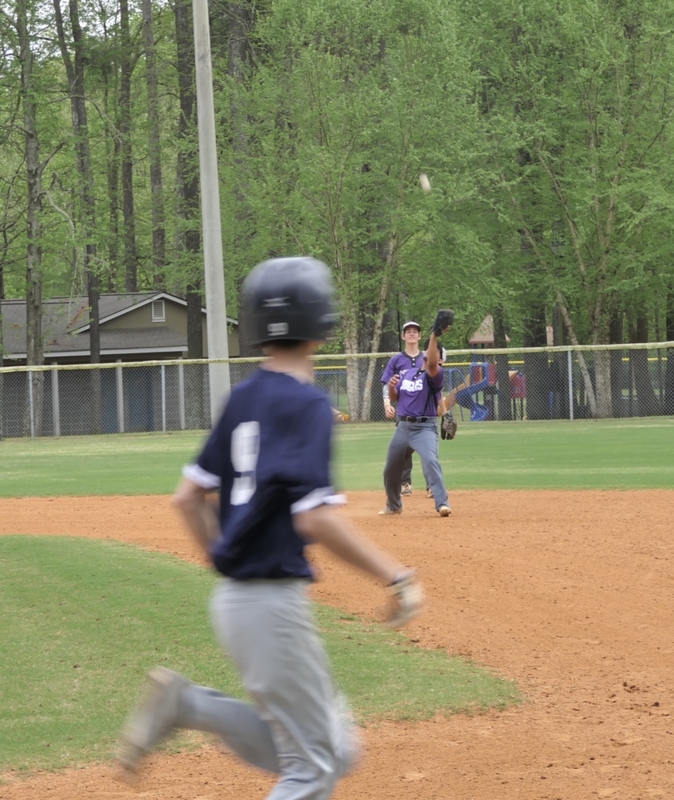 In the bottom of the inning, the Cougars bats woke up and produced a score on a walk by Senior first baseman Alex Hoeve who stole second base and was later brought home on a single by Junior left fielder Dalton Lantz. Score now reads TCS 1, St. George 3. 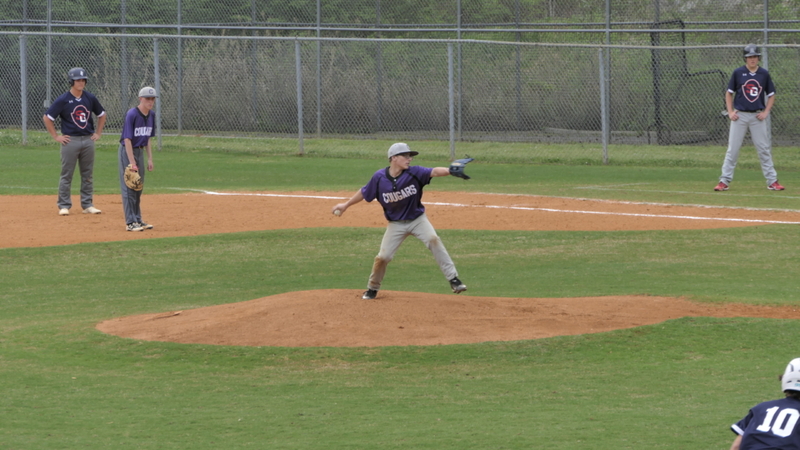 In the top of the fourth inning Junior pitcher Seth Goldberg settled down and handled the visitors easily as he stuck out on and induced a weak ground ball back to the pitcher and a pop out to Senior first baseman Alex Hoeve to end the inning. The score remained the same. 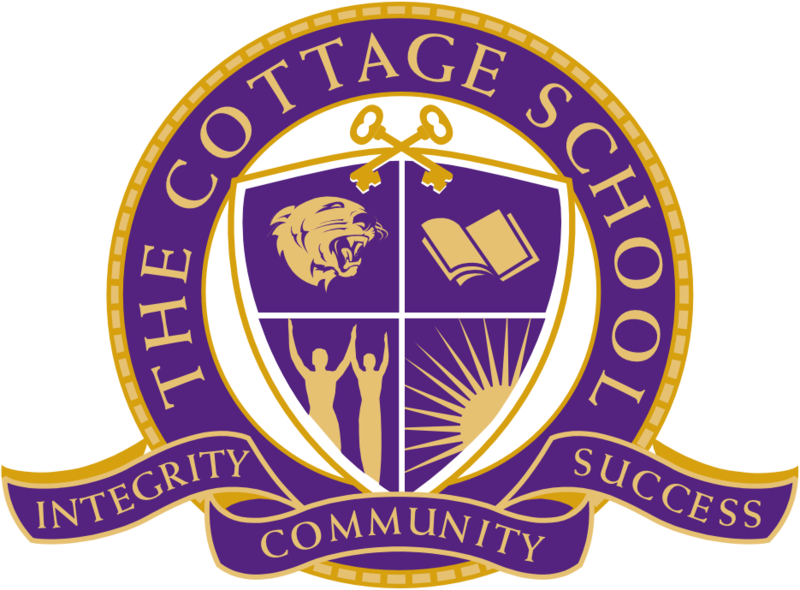 In the bottom of the fifth inning the Cougars bats came to life as the Blue and White clad team in the other dugout made the fatal mistake and changed pitcher. 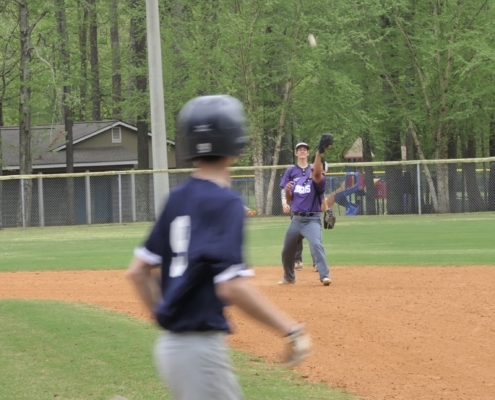 Lead-off hitter, freshman Aidan Briggs was then hit by a pitch. 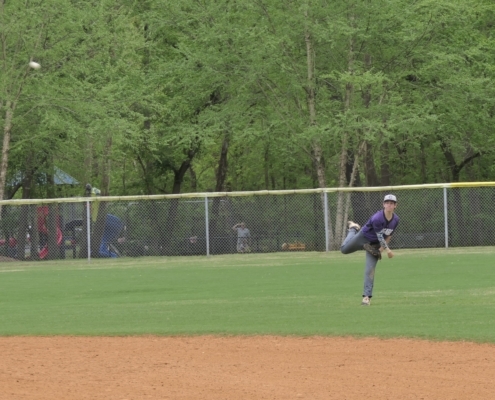 Pitcher Seth Goldberg then hit a single placing runners at first and second. The next batter, Junior shortstop Shane Hendrickson walked loading the bases. 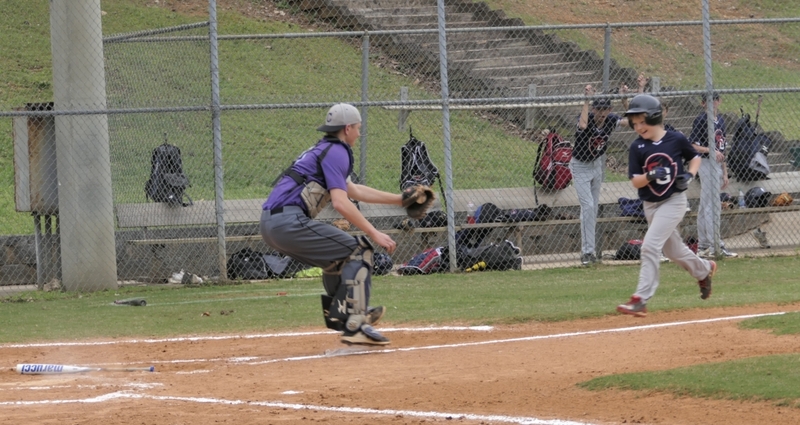 The next batter, Senior Catcher Brett Boyles also walked forcing in Briggs with the second run of the game for the Cougars. After a strikeout Junior right fielder D. J. Donaldson then sent a short to left field for a single scoring Goldberg from third for the third run of the game. Junior second baseman Mac DeBalsi then grounded out into a 5-3 out but was able to drive in the fourth and fifth runs of the day as Hendrickson and Boyles both scored Donaldson advancing to second. The next batter, Junior Left Fielder Dalton Lantz then walked and stole second with Donaldson going to third. Senior third baseman Murphy Husnik then laced a double scoring both Donaldson and Lantz for the sixth and seventh runs of the game. Husnik the stole third and came home with the eighth run to end the scoring for the fifth inning. The score at the end of five complete innings of play. The home team 8 and visitors 3. 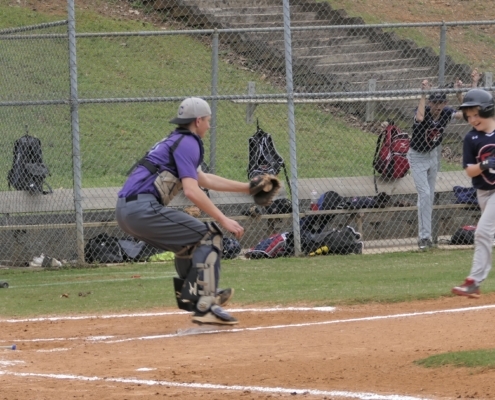 The next inning saw Junior Shane Hendrickson come in and shut down the visitors to end the game. Final score, TCS Cougars 8, Dragons 3. 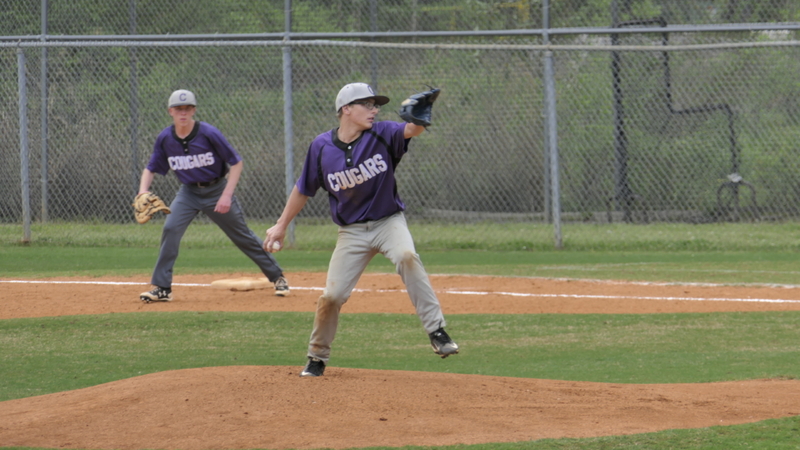 Next up: Atlanta Jewish Academy, Tuesday at the Cougars Den at 3:15.